More than 100 Tantalizing Tortillas Recipes for Appetizers, Main Dishes, Soups, Salads & Desserts. Cookbook. This cookbook has the best tortilla soup ever. Mexican recipes. What could be better than a fresh, hot, homemade tortilla? 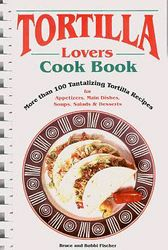 This book features traditional Southwestern favorites and a host of exciting, innovative tortilla dishes. This is a wonderful book. I haven't seen any other like it. Has wonderful recipes and I can't wait to try them all. Very good investment. this cookbook is a very good investment to my cookbook collection. I love the recipes in this book. I have not yet made all of them, but i plan on it.